The exploitation of non-human animals is prominent within nearly every country on earth. However, unlike issues such as gender or racial equality, non-human animal welfare seems to be one of the most invisible forms of oppression quietly and consistently operating in the background of society. Being born human hardly grants us the moral authority to subject other sentient creatures beyond the realm of our species to cruel experimentation, brutal traditions, and a life of involuntary servitude for our mere entertainment. 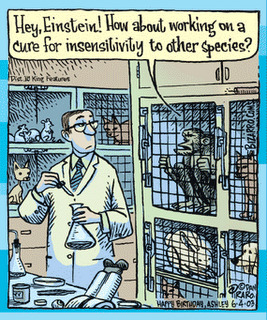 Non-human animals have been routinely subjected to the worst kinds of scientific experiments. For instance, in 1944, toxicologist John D. Draize invented the Draize Test, which was used to evaluate the risks of human exposure to cosmetics. The procedure involved applying a small amount of the substance being studied to an animal's eye (usually rabbits) or skin for several hours, and then observing whether irritation occurred. In most cases, regardless of the results (blindness, infection, pain, or nothing at all), the animal subjects were put to death upon completion of the test. In 1946, pigs, goats, guinea pigs, rats, and mice were placed on the lower and upper decks of US-owned naval vessels in the Pacific. Shortly after, an atomic bomb was set off nearby. Roughly 2-3 days later, most of the animals involved exhibited cases of anorexia, bloody diarrhea, and extreme irritability. Lesions observed during autopsy were of three types: hemorrhagic, infective, and degenerative, resulting in ulcers of the gastro-intestinal tract and tonsils. Eleven years later, pigs were unloaded off trucks into the desert and subjected to a nearby atomic bomb blast. The lucky ones quickly perished, while the less fortunate who managed to survive were fatally burned and sickened by large doses of radiation, left to suffer slow, agonizing deaths. During the 1960's, tobacco companies used animals in experiments to instill doubt in consumers by delaying and confusing links between their products and cancer. In one experiment, nearly 20 dogs (Beagles) were trained to smoke up to 12 cigarettes a day. Within the first two weeks, the dogs began suffering from a variety of ailments. Eventually, autopsies revealed that the dogs had slight changes in the tissue around their lungs, with advanced cancer cells present. During the mid 1970's, monkeys were trained by the US military to manipulate a joystick by maintaining a constant positioning of it to simulate the operation of an aircraft. Then, to determine their efficiency while flying "under attack," the animals were subjected to medium and larges doses of radiation. According to the military's report, the monkeys demonstrated mouthing, retching, and productive emesis (vomiting). Throughout the 1980's, about 19,000 dogs, rabbits, pigs, ferrets, rats and mice were butchered during various automobile safety tests performed by General Motors. Experiments resulted in skin shredding, chest injury, and polluting of the lungs via auto emissions. In 2009, USA Today reported that military researchers dressed live pigs in body armor, strapped them into Humvee simulators, and then detonated them with explosives to study the link between roadside bomb blasts and brain injury. What would the public's reaction be if it were one day leaked that the military kidnapped random people, loaded them on to boats, and then detonated a thermonuclear weapon nearby to test the outcome? How would we feel if certain individuals were treated like lifeless dummies, forcefully subjected by auto companies to brutal car crashes? Would we be okay with strapping human babies to Humvee simulators and then blowing them up? Obviously, such ideas would be out of the question, which is exactly the reason why non-human animals have been used in their place. Experimenting on other humans without their consent has -- at least in recent years -- become largely frowned upon in modern societies. Still, such logic is somewhat puzzling. The non-human animals used so often are selected precisely because of their physical and emotional similarities with humans. Like us, they experience fear, pain, and suffering. The only substantial difference between them and us is their lack of humanity, but is that really a justifiable excuse to subject them to such types of of brutal experimentation? Aside from becoming the victims of scientific testing, non-human animals are needlessly and regularly killed around the world for sport, tradition, and entertainment. In South Africa, one particularly controversial practice known as "canned hunting" allows hunters to pay for entry to an enclosed area where "trophy animals" -- such as lions -- are trapped, hunted, and eventually gunned down. The hunter walks away with a rare animal hide to show off, and the "canned hunt" operators walk away with a fatter wallet. Everyone but the slaughtered animal benefits from the exchange. 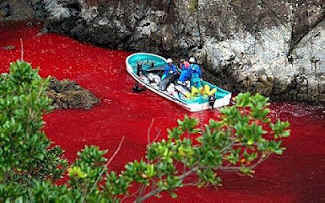 Elsewhere, in places such as Japan, thousands of dolphins are butchered every year under the guise of tradition. Hunters use loud noises to confuse their hypersensitive sonar, drive the dolphins into coves sealed by nets, and then slaughter them with knives and spears. Once all the animals are killed off, their corpses are loaded on to boats and taken to warehouses for processing. As with dolphin hunting, bullfights are continued today largely because of tradition, even though the practice is perhaps one of the most barbaric on the planet. In 1996, 40 million spectators attended bullfights and bull-related festivals in Spain, with a record 650 fights and 3,900 dead bulls. Essentially, the bull is taunted, slowly weakened with tiny barbs, and finally, after much suffering, stabbed in the heart. 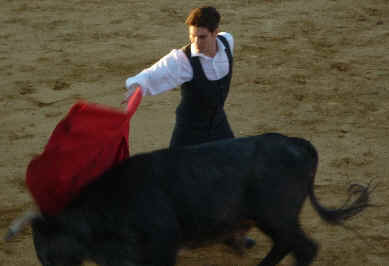 Once the bull is killed, the carcass is dragged from the arena, quartered, and dressed. Sometimes the bull's meat is given to the poor, but usually it is sold on the market. Whereas bullfighting is human v. non-human, dogfighting is purely non-human v. non-human, and although the practice has been outlawed in most parts of the world, it nonetheless remains popular in Latin America, Pakistan, Eastern Europe, and clandestinely in the U.S. and the United Kingdom. A database run by animal advocacy group Pet-abuse.com shows reports of dogfighting cases increasing from 16 in 2000 to 127 in 2006. The Humane Society of the United States estimates that at least 40,000 people are involved in the industry domestically. Because fight dogs have been bred to attack and kill, almost all of them are euthanized when dogfighting rings are broken apart. Perhaps the luckiest non-human animals (which isn't saying much) are those locked away in zoos and circuses for human entertainment. These animals not only tend to be mistreated by their handlers, but the animals themselves often exhibit behaviors unnatural to them, such as depression and hostility, primarily due to being taken out of their natural environments. As reported by the New York Times: "The typical zoo enclosure for a polar bear is one-millionth the size of its home range in the wild, which can reach 31,000 square miles." Elephants abducted in to the entertainment industry have also become a cause of concern. Linda Huebner, Deputy Director of Advocacy for MSPCA-Angell -- a non-profit animal welfare group -- writes: "The use of bullhooks and restraints is extremely cruel, causing painful injuries and adding to these animals' already intense suffering. Moreover, they do not mitigate the huge threat to public safety inherent to forcing large wild animals to perform unnatural tricks in front of large crowds of people." The non-human animals which avoid becoming victims of experimentation and needless exploitation will perhaps find themselves born into one of the worst hells imaginable: the industrial farm. In the United States alone, 10 billion land animals are slaughtered every year in feces-crusted, disease-ridden factories which make even the worst Holocaust camp look like Disneyland. Sentient, non-humans spend short lives in such facilities wallowing in painful misery, getting sick and fat with nothing to look forward to except a gruesome death. Most of these places are so horrible that it only takes showing the public what's inside to drastically lower meat demand, according to researchers at Kansas State University. Perhaps that's why the meat industry has been lobbying so hard in recent years to increase legal penalties for undercover investigations at these types of establishments. Not too long ago, there was a point in human history when taking the lives of non-human animals may have been necessary for our survival. In some places around the world, that may even still be the case. But in modern societies, sentient, non-human beings are being needlessly and brutally over-slaughtered in an unrecognized genocide, subjected to torture, suffering, and death for outdated traditions, entertainment, sport, and profit. Recognizing the indiscriminate cruelty against non-human animals is the first step towards ending it. So long as we remain blind to the ongoing oppression -- whether by choice or ignorance -- it will continue to take place, and millions of innocent souls will pay the ultimate price as a result.